The slow motion replays appear to point in one direction but Eddie Jones and Farrell can continue their seemingly premature celebrations when referee Angus Gardner and TMO Olly Hodges decide that it's part of the game. "I think there's nothing wrong with the height," says Stander, who will win his 27th Ireland cap tomorrow against Argentina. "I think there's probably talk if he wrapped up or not. I'll tell you this I wouldn't like to be the referee to try and make that decision but it was for sure a momentum stopper." Asked to what extent Ireland have practised or spoken about the new clampdown, Stander says: "We pride ourselves on our discipline, in training and in the game. "We pride ourselves on our entry into the tackle and it's a big thing we drive defensively as leaders in the team and as players. 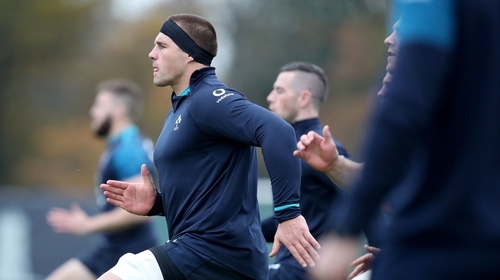 "It's a thing that when Joe [Schmidt], or a coach, normally shows us the hot topics from the referees or World Rugby and we go through it but it's another thing that has come in. This is the height and we stick to the rules." Stander is itching to get into the action having rested as Ireland beat Italy in Chicago and Munster won away at the Cheetahs. He said: "I was in Limerick watching Ireland play and then Munster play. I felt like I was part of nothing last weekend, but got a good rest and was good to spend some time at home with the wife. "Weekends is game time and you want to be out there and playing. The boys played so well, some of them really put their hands up and to get the score they did was really impressive. "If you asked me [if I needed that rest] five years ago I would have said no, but as you get older, for sure. "You need a break whenever you can get them and enjoy them. Make sure you get that break and the time with your family is important and if you don't get that during the year as well, it's probably a place you slip." Stander wasn't around when Argentina handed Ireland their tails at the 2015 World Cup but says that the squad still bear some of the scars of that infamous defeat. "There are a few boys who played against them [in the World Cup] who are still in the squad and they can talk to us and tell us how they felt. "This weekend is another big test for us, to see where we are against a southern hemisphere team, especially where we want to be going into next year. "You need to use those memories and remember how you felt that day and what they did to you. "If you don't match them up physically in the first 10 minutes they're going to rip you apart with their back line. "They're a team that can attack either side of the ball, they've got unbelievable backs and their physicality is the biggest thing that keeps them in the game."